The only real cooking in this recipe is for the sweet potato and the corn, and both can be done in the microwave. Microwave the potato, peel it, cut it into chunks. Heat a non-stick skilled to high, then (after it is good and hot) put a little vegetable oil. Throw in the sweet potato, sprinkle with garlic powder and chili powder, and squirt some lime juice. Toss the potato chunks quickly while they blacken. Set aside to cool. Microwave the corn in the shuck for 4 minutes; it’s easy to remove the shuck and silks. Let it cool and cut off the kernals. Toss everything. Taste it to see if you want to add salt; you probably don’t need any. This is a gluten-free recipe, as long as you serve it with gluten-free corn chips. If you share this recipe, be sure to provide a link back. To receive an email notice when there is a new recipe, click on “Follow Blog Via Email” at the top right of the page and enter your email address. You won’t receive emails about anything else, and we will never share your email address with anyone. Artist, marketer, blogger, and sometimes cook. 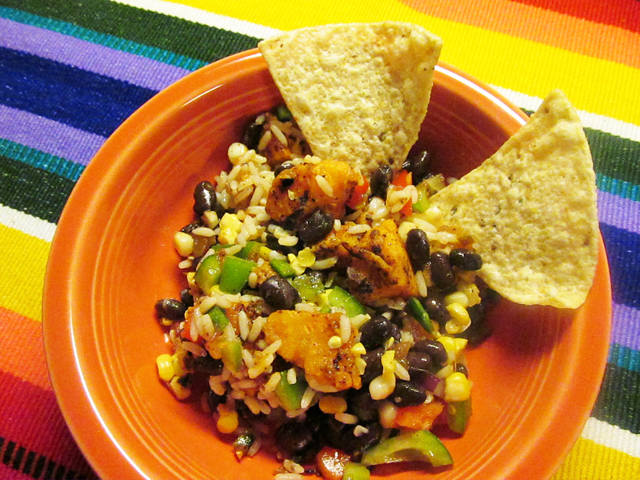 This entry was posted in Gluten Free, Salad and tagged black bean salad, gluten free recipe, mexican bean salad, ovolactopesco. Bookmark the permalink. Oh, yum! This looks so delicious!